The sky will be filled with shooting stars this weekend thanks to debris from Halley's Comet. The annual Orionid meteor shower will see around 20 meteors passing through the sky every hour. 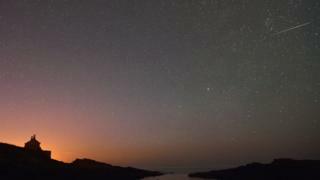 The shower is visible throughout the month, but experts say the peak time to view it in the UK will be early on Sunday, between midnight and 03:00 BST. Astronomer Tom Kerss said the Orionid meteors are known for their "speed and brilliance". Halley's Comet is the only comet regularly visible from Earth by the naked eye and it comes into view once every 75 years. The last time it appeared was in 1986, with the next viewing expected in 2061. When Halley's Comet passes through the solar system, particles of debris break away from it. These hurtle towards Earth at the speed of 148,000mph, and we see them as shooting stars. Mr Kerss, who is based at the Royal Observatory Greenwich, recommended secluded spots with the darkest skies for the best view, but he said not to worry about bringing any equipment. "There's no advantage to using binoculars or a telescope," he said. "Your eyes are the best tool available for spotting meteors." "So, relax and gaze up at the sky, and eventually your patience will be rewarded."